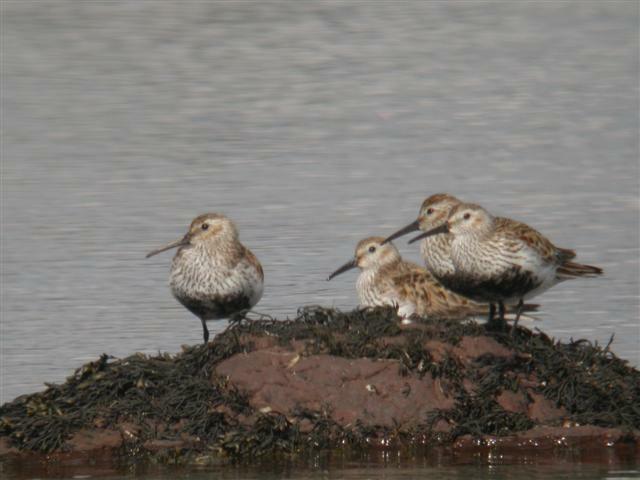 According to Gray’s account in the “Birds of Arran” (Bryce 1872) Dunlin were “plentiful breeding on all the hills of moderate elevation in the district”. In the early nineteen eighties the bird was described as a rare breeder and in more recent years there have been no breeding records. These changes in Arran are matched by declines in many areas south of the Great Glen so that now in Scotland, the breeding birds are concentrated in the Flow Country of Sutherland and Caithness and in the peatlands of the Northern Isles, Outer Hebrides and the Grampian Mountains. Open areas of grass and moss, near pools and wet flushes in upland and moorland are favoured breeding places. There was a serious decline in numbers in the Uists following the introduction of hedgehogs there in the nineteen eighties. 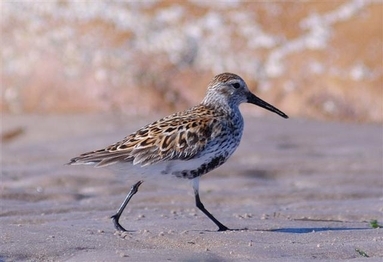 Internationally, there are nine sub species of Dunlin breeding in a continuous band right round the Arctic. Three of these sub species, including the Scottish breeding population, have been recorded in Scotland from breeding areas stretching from north-east Greenland through Fennoscandia to north west Russia. All the species migrate south to winter at more southerly latitudes mainly along the coasts as far south as the equator. 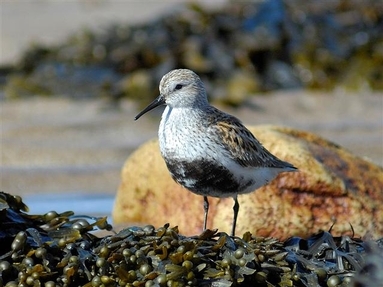 It is on this passage in both spring and autumn that you are most likely to see this wader on Arran’s shores. Its fat shape and slightly down-curved bill are worth studying so you'll find it easier to pick out less familiar shore birds. Most Dunlin in spring and autumn show signs of either the black belly which is part of the smart breeding plumage or black spots on the flanks which are typical of juvenile plumage. Only in winter plumage do they have completely clean flanks and bellies and then you have to rely on shapes and sizes to identify them. In flight, the Dunlin is one of a dozen small waders which show a pale wing bar and white sides to the tail.